The reason courts of law were established was to place justice ahead of revenge. In spite of that, people, since the dawn of time, have been taking matters of retribution into their own hands. Particularly when they want to keep the alleged crime from being the subject of gossip and publicity or when the law’s involvement would cause scandal and shame deemed better to avoid. Classic literature brims with tales of individuals exacting the penalty they see as fitting in preference to trusting to the supposed impartiality or wisdom of judicial authority or, worse, the court of public opinion. A grand model for many plays about revenge within families is Euripides’s trilogy, “The Oresteia,” in which Orestes, son of the house of Atreus, is persuaded by his sister, Electra, to address the suspected murder of his father, Agamemnon, by his mother, Clytemnestra, and her paramour, Aegisthus, a claimant to Agamemnon’s throne, by killing the adulterers and restoring the family’s honor and integrity. Eugene O’Neill, seeking to create a classical tone to American theater, seized on “The Oresteia” to frame a trilogy of his own, “Mourning Becomes Electra,” a 1931 piece that comprises three closely connected one-act plays, “The Homecoming,” “The Hunted,” and “The Haunted,” which work best when they are enacted together in one evening, as one long, continuous drama. 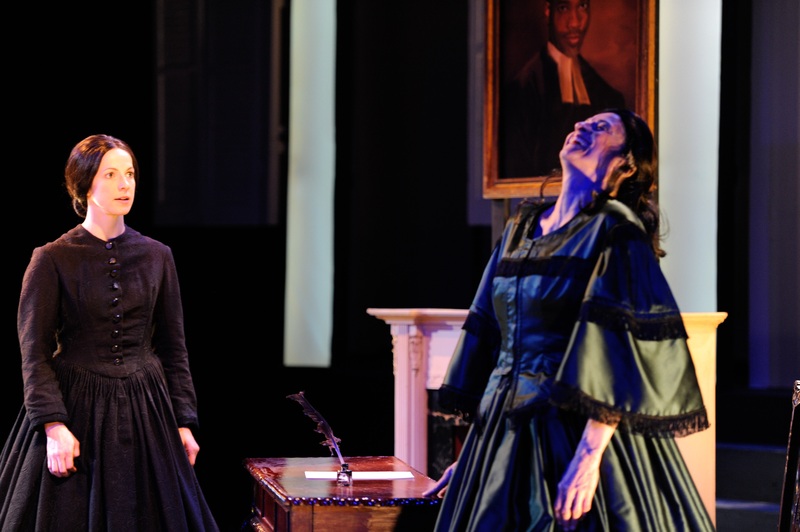 Such an undertaking is daunting because a full production of “Mourning Becomes Electra” takes about four hours to perform. Obviously Alexander Burns, the artistic director of Mt. Airy’s Quintessence Theatre, was not discouraged by the demands he would make on his audience and cast for “Mourning Becomes Electra.” His company’s production, on stage at the Sedgwick Theatre through April 27, holds interest throughout a performance that can be unevenly acted but never becomes tiresome nor unengaging, Burns, the show’s director, and O’Neill always providing something genuinely dramatic and worth hearing to keep you involved. I’m not sure if what I say next will turn out to be the accolade I intend, but I was surprised when I glanced at my car’s clock and saw four hours had passed since I entered the Sedgwick. I, who years on live television have given a pretty accurate feel for lapsed time, would have judged the show to have lasted only three. It is to Burns’s credit that his production remained intense and fulfilling enough to give the impression four hours passed more quickly than they did. The Quintessence production focuses on the essentials of O’Neill’s plays, intrigue, murder, and revenge among the Mannon family of New England, a clan that became wealthy from shipping and parlayed their financial clout into social and political status, Ezra, the Agamemnon figure, ironically becoming a judge. The behavior and motives of every character on the Quintessence stage remains clear throughout, and Burns knows how to build suspense, at times abetted by lighting designer John Burkland, and sound designer, Steven Cahill, who also composed the heavily-keyed piano score that introduces and plays between scenes. O’Neill’s telling of an American “Oresteia” is compelling in its detail and the chance the author gives major characters to explain what is going on in their minds as they plan a bold action that is usually devised to redress a wrong the perpetrator considers heinous and unforgivable. O’Neill makes you privy to everyone’s point of view. By so completely foreshadowing what is plotted to happen, he intensifies expectations and fosters the pity and terror Aristotle, a century younger than Euripides, declared in his “Poetics” to be the hallmark of tragedy. Veteran actors Janis Dardaris, as Christine Mannon (Clytemnestra) and Robert Jason Jackson, as Ezra Mannon (Agamemnon), especially elicit pity and terror with their thorough and complex portrayals. Their scenes together are extraordinary, especially one in which Jackson’s Ezra speaks plaintively of a rapprochement with his wife whose bitterness against him he understands and desires to change. Mattie Hawkinson and Josh Carpenter also do well with the characters of Lavinia (Electra) and Orin (Orestes) Mannon, but their acting styles are not as polished or as subtly immediate as Dardaris’s or Jackson’s, and it takes more time for them to make an impression and establish the depth and scope of Vinnie and Orin. Luckily, O’Neill’s writing and the length of “Mourning Becomes Electra” favor them, and they grow in a way that makes it seem as if the actors are maturing as their characters do. 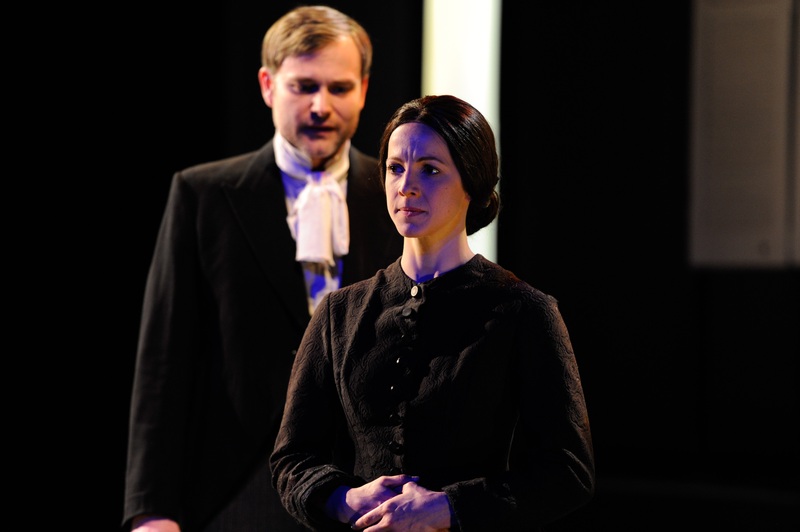 Burns is fearless in letting “Mourning Becomes Electra” run its full course without being cut by much or rushed. The only time speed or pace is an issue is in Hawkinson’s initial scenes, when Vinnie seems to be speaking too quickly, and the actress gives no texture or emphasis to her words. These sequences are a bit unsettling because they make you wonder whether all the readings will be so fast, stream-of-conscious, and unaccented. Relief comes with the entrance of Andrew Breving as Adam Brant (Aegisthus), who sets a different pace from Hawkinson’s and puts Burns’s production in more comfortable motion. Once that happens, “Electra” is allowed the time to breathe and give its story intensity that doesn’t flag or make the audience restless. O’Neill has done his job well. You see the how the ancestral line and traditions of the Mannons have given them a vaulted, almost regal, position among the people in their region of New England. The Mannons are respected and asked for their opinion on anything of consequence in their community. You understand the emotions and intrigues that propel the family into extreme actions and can simultaneously empathize and become alarmed with how often characters opt to take ultimate, irreversible steps to achieve an end that is bound to cause more misery than the satisfaction they intend. O’Neill involves you on the page. Burns and company engross you on the stage. O’Neill gives “Mourning Becomes Electra” a martial tone. It is set at the end of the Civil War. Although the Mannons live in New England and have primarily Yankee traditions, their home, one Ezra’s father designed, is accented by white columns that remind one of the ante-bellum South. You half expect Vinnie and other characters to have Southern accents. Ezra Mannon, a general who has distinguished himself in Ulysses Grant’s service, is returning home after years at battle, years during which Christine ran the Mannon estate and found gratification and peace in doing so. Also coming home from the war is Orin, Christine’s cherished child whom she wanted to spare from war’s ravages and who has sustained a head injury of small consequence. War informs all three plays comprised by “Mourning Becomes Electra.” Although O’Neill retained the Civil War setting in his script, Burns brings attention to the universality and ongoing nature of war by setting “The Hunted” after World War I and “The Haunted” after the Korean War. This provides more work for costume designer Jane Casanave and her assistant, Kaki Burns, as they need to go from taffeta and crinoline in “The Homecoming” to high heels and suits and ties in “The Haunted.” It is interesting that “The Hunted” retains a reference to “Grant” when the line could have adapted to “Pershing.” Burns also adapts O’Neill by eliminating the chorus of townspeople who, in the tradition of Greek tragedy, comment on all that happens to and within the Mannon family. With war and what is takes to be a soldier as a background, death is another overarching theme of “Mourning Becomes Electra.” Ezra and Orin both speak of how their war experience and the constant sight of corpses inured them to death and hardened them to its inevitability and finality. Orin says the prospect of death makes a person indifferent towards it and motivates a soldier to fight harder, not so much to preserve life as to bow to the realization that being surrounded by the dead makes you callous towards the value of life. He underscores the idea of a soldier as a cog in a military machine. He also talks of a dream he had about combatants on both sides of the battle line putting down their weapons and sharing food, liquor, and some good jokes. He says a deed his father deems as heroic had its genesis in that dream. None of the Mannons prove bashful or wanting when human destruction becomes an objective. Orin, who has the weakest nerve and shakiest resolve, can be goaded into perpetrating the foulest of deeds if someone makes a good enough argument or accuses him of cowardice. Ezra is driven by duty, responsibility, and a view of manhood that includes not only fighting but being a leader. Christine is fueled by hatred and resentment that stems from her unhappy marriage and a belief that Ezra is most content when he takes away things and people she loves. Vinnie is the most classic of the Mannons. She observes coldly as has more passion for retribution than she has compassion for what humans endure or the acts they commit to maintain their sense of what is just. Vinnie, of all the Mannons, has a rigid and unyielding idea of justice and just as compulsive a need to see her version of it executed in a way that whomever Vinnie condemns will know he or she has come under her judgment and is paying fairly for her perception of their foul deed. Vinnie is the true believer, the politically correct Mannon, who can’t take in more than her point of view and insists on vindictive punishment for any who acts counter to her standards and becomes subject to her pronouncement of their fate. Though the only Mannon who enacts no violence, Vinnie is capable of causing another person’s end and is the most dangerous of her breed. She is also her family’s survivor, hence their mourner. Mythology, history, Euripides, and O’Neill all saw the consequence of that outcome. Lavinia Mannon does as well. Burns’s production establishes the conflict between the major characters from the beginning. You have no doubt about how one member of the Mannon family feels about another. Except for Orin, they are a confrontational group who say their individual peace as much to clear the air so they can proceed with their intentions as to ameliorate a situation, beg approval, appease each other, or seek solace or forgiveness. Dramatic tension constantly emanates from the Quintessence stage, and in addition to the forthrightness with which Burns’s actors play their scenes, you are treated to O’Neill’s idea of each character’s psychology and ask questions of your own about whether a given character is behaving justifiably when that character says he or she is exacting justice. Mattie Hawkinson radiates ice as Vinnie. The moment we meet her she is denying affection for Adam Brant while telling a worker on the Mannon estate how she was going to trap Brant into giving her information she craves to have. Though Vinnie is minutely buoyed by the imminent prospect of her father’s return home, she comes across as skeptical, scheming, and bitter, traits that will inform Hawkinson’s performance throughout O’Neill’s trilogy. With the exception of the opening scenes of “The Haunted,” Hawkinson’s Vinnie is always severe, always unimpressed, and always intent on having her way no matter the damage that may cause. The actress displays no give. Her Vinnie is absolute, calculating, and discontent to the point you cannot believe she had ever enjoyed a pleasant, carefree day in her life. Hawkinson’s facial expressions, ramrod posture, unadorned black clothing, piercing stares, and withering treatment of others show how deep-seated Vinnie’s dislike for her fellow humans is and how superior, in morals and intelligence, she believes she is. Hawkinson’s Vinnie can be a great persuader, and an adept politician, when she uses feigned softness to acquaint Orin with the crimes of which she accuses their mother. She can even show some signs of nervousness, for example when she and Orin are waiting at a Boston port for the right moment to pounce on their prey. Mostly she is all hardness and disdain. Vinnie walks on to the Quintessence stage, and you can feel the chill. Physically, Hawkinson is an impressive actress. She exudes Vinnie’s idea that she is the conscience, chief inquisitor, and primary deliverer of justice of the world. Vocally, Hawkinson needs to work on texture, on letting the purpose of a line or the felicity of a phrase have its effect before moving on to the next volley of dialogue. At the top of “The Homecoming,” her conversations with Terence Gleeson as Beckwith, the caretaker of the Mannon estate, and Andrew Breving as Adam Brant, seem to have no aim. Hawkinson turned them from dialogue into a rapid ramble that took the drama out of her lines. You can comprehend the meaning, but the sense that one person was revealing something, or trying to elicit something, from another was absent, lost in the rhythmless speed and unemphasized intent Hawkinson gave Vinnie’s speeches. I don’t know whether Hawkinson’s delivery became more pointed as “Electra” proceeded, or if I became accustomed to her approach to dialogue, but I came to settle into the acidity and high-mindedness with which she played Vinnie. I saw the actress’s talent. In the long run, Vinnie carries “Mourning Becomes Electra.” She is the catalyst or direct cause of almost everything dire that happens. With her austerity, Hawkinson took command of the tone of Burns’s production. It took Breving and Janis Dardaris to come on stage to establish a pace and give O’Neill’s play the weight and thematic power it retained for the rest of the performance. Josh Carpenter is another who shows gobs of talent, a true gift for acting, but has to work on the clarity and bite of his speech. Orin is different from the other Mannons in several ways. He does not carefully observe his family’s dynamics and is relatively unaffected by them. Sure, he is aware his parents do not get along. He is aware his mother favors him while his father favors his sister, Vinnie, but this understanding does not disturb Orin. The only way he becomes caught up in the psychology of the Mannons is by being glad his father insisted he join the Union army and go to war against the Confederacy. Leaving Christine, who spoiled him and showered him with maternal love, to fight under the command of Ezra was a conscious act of defiance, a declaration of independence of sorts that might allow Orin to discover his nature away from his parents’ tug of war. The most important difference between Orin and his kin is he is able to feel and be racked by guilt. Orin has been involved in Vinnie’s plans at her demand. While he can be stirred to righteous indignation and say all of the right things a son or injured party should say when faced with the unspeakable, Orin would rather seek peace or turn a blind eye to any perfidy around him than to act against another human. The war provided him with enough experience with death and combat. Orin would rather have the solace of the oblivious and a pass that would exempt him from delving too far into matters that may upset him or induce him to some definitive action. Carpenter can convey this larky, almost innocent side of Orin while showing how participation in the front lines during the war affected him. Carpenter can play Orin at his most benign or as an avenger who roars with irate fury when moved to exact the justice Vinnie goads him into being eager to address. Carpenter finds and displays the moods and mercurial nature of Orin. The young man we see in “The Homecoming” or “The Hunted” is not the tortured, guilt-ridden soul we meet in “The Haunted.” Like Hawkinson, all he has to do is gain constant control of his speech which at times becomes less articulated than usual and even mushy. Time has already honed the gifts of Janis Dardaris and Robert Jason Jackson, who plays the elder Mannons and do so with a combination of fire and elegance, but most of all with humanity, that takes Burns’s production to a higher, quite lofty, plane. I was questioning Dardaris’s absence from local stages around the time I learned she would play Christine for Quintessence. Once she appeared on stage, I knew why I missed her. Dardaris can convey a complete character in a compact, economical way that goes beyond line readings. She succeeds in making Christine sympathetic although Christine is the first Mannon who plans to kill with impunity and for reasons that don’t ring true as being necessary. While Hawkinson’s Vinnie is cold-blooded, Dardaris’s Christine is all warmth and passion, so much so it warps her sense of right and wrong, her ability to think of all that is possible before plotting and embarking on a rash act that will predictably bring about the opposite of what she expects. Christine may often be wrong and impulsive. Dardaris makes you listen to her arguments, her reasoning, and even when they defy logic or show an outpouring of passion that contrasts with Vinnie’s austerity, Dardaris makes you want Christine to prevail in some way. O’Neill gives Dardaris the tools to make a case for herself, and Dardaris becomes Christine’s most likeable, sympathetic advocate. Vinnie may have all of the trumps, evidence and logic, in her hand, but Christine earns your affection. Dardaris makes that happen. She is so real and expresses Christine’s unhappiness so touchingly, you don’t see Christine as evil. Vinnie, who really does have justice on her side, becomes the heavy, the one who doesn’t have the love or romance to see a complete picture and understand why Christine sees killing as the only way out of her plight. In a way that will presage Lillian Hellman’s Regina Giddens, you have an affection for Christine even as she lies, her actions being counter to her words, to Ezra and engineers a death he may have suffered anyhow. You know how effective Dardaris is because Robert Jason Jackson is a powerhouse, and Dardaris still leads you to Christine’s side. Jackson’s Ezra is the figure of rectitude. He is a man who has seen and understands the world. The Civil War has added to his education because he has come to terms with mortality. His acquaintance with death urges him to seek a more harmonious life. Ezra admits what a dismissive, unloving, unfaithful husband he has been to Christine. He talks openly about the disgust for each other that developed soon after their marriage and that tainted Christine’s affection for Vinnie and triggered her adoration of Orin. Jackson’s playing of this confession scene is masterful, as is his entire performance. With a rich bass-baritone that fills the theater and pronounces that power and reason have come home along with Ezra, Jackson is every inch the judge, general, political leader, and overall pillar of the community he is reported to be. Jackson’s Ezra is a man who is born to command and born to be obeyed. He is also a learned man who is affected by age and experience. He sees the mistakes of his past, and he seeks to redress them. He speaks sincerely to Christine about the love they enjoyed during their courtship, the respect he continues to feel for her in spite of the distance he admits to putting between them, and the restoration of their mutual regard he would like to accomplish. However strict or stern Ezra once was or appears to be in public, Jackson endows him with aching humanity as he speaks in a most truthful, tactful, and purposeful way to the wife he would like to once again have as a partner, in running the estate and in having a sexual life in their bedroom. You don’t know who you want to succeed in the crucial scene in which Ezra’s weak heart looks as if it is overstrained, and Christine stands studying what to do, whether to help Ezra, whether to let nature take its course, or to go through with a plot to kill him. Jackson and Dardaris both plead their cases so well. Of course, Jackson’s, Ezra’s, is the stronger, but the actors, O’Neill, and Burns deserve credit for making unsure about where to place your allegiance when murder of a man you have come to see as good is one alternative. Jackson is a towering figure. He made a great impression as Duncan in Dan Kern’s “Macbeth” for Temple this year. He makes an equally fine showing as Ezra Mannon. I hope he becomes a staple on local stages. Andrew Breving turns Adam Brant into more of a chameleon than Christine is. He can be sincere in duplicity, wooing Vinnie convincingly while anticipating his next tryst with Christine and the murder of Ezra, for which he harbors motives that go beyond relationship with Ezra’s wife. Breving brings balance to the Sedgwick stage. He is a strong and critical presence every time he appears. As years pass and Vinnie changes, the Mannons’ neighbor, Peter Niles never loses his affection for her nor the hope that he and she will someday wed. Alan Brincks plays Peter with sweet consistency. Even in the scene in which his relationship with Vinnie, now his fiancée, has allegedly turned Peter hard and quarrelsome with his mother and sister, Brincks shows Peter’s innate decency and pleasant conventionality. Erin Mulgrew ‘s Hazel Niles serves as the good woman who listens to Christine and Vinnie without much judgment and who seems likely to preserve her innocence until she weds. Orin is her preference, but Hazel is content living with her brother and mother who seem to lead a cozy existence. Mulgrew sheds naïve light as Hazel, a character who compares favorably to Vinnie in that Hazel only has to practice her natural humanity and morality to remain good and of high character whereas Vinnie is self-righteous and aggressively vindictive. Mulgrew and Hawkinson have an excellent scene in “The Haunting” in which the women fighting for Orin’s care also do battle over a manuscript with which Hazel has been entrusted, a document that may reveal all that Vinnie has worked so assiduously to keep hidden. “Mourning Becomes Electra” runs through Sunday, April 27 in a production by Quintessence Theatre at the Sedgwick Theatre, 7137 Germantown Avenue (between Mt. Pleasant and Mt. Airy Aves. ), in Philadelphia. Showtimes are 6:30 p.m. Wednesday and Thursday, 7 p.m. Friday and Saturday, and 2 p.m. Sunday. General admission tickets are $25 ($15 for people age 21 and younger) and can be obtained by calling 215-987-4450 or going online to www.quintessencetheatre.org. I leave a response when I like a post on a website or I have something to valuable to contribute to the conversation. And after this post Mourning Becomes Electra – Quintessence Theatre Group at Sedgwick Theatre | NealsPaper. a few of the responses look like they are written by brain dead people? 😛 And, if you are writing on additional online sites, I would like to keep up with anything new you have to post. This entry was posted on April 15, 2014 by nzoren in Theater Reviews and tagged Alan Brincks, Alexander Burns, Andrew Breving, drama, Erin Mulgrew, Eugene O'Neill, Euripides, Janis Dardaris, Josh Carpenter, Mattie Hawkinson, Mourning Becomes Electra, Oresteia, Quintessence Theatre, Robert Jason Jackson, Sedgwick Theatre, Terence Gleeson.